The European Red Bull gave wings to aspiring student artists during this event, where 28 Red Bull canvas coolers were transformed into functional and unique pieces of art over a month long creative process by 20 student artists and 8 established local artists. ONE DAY ONLY!!! 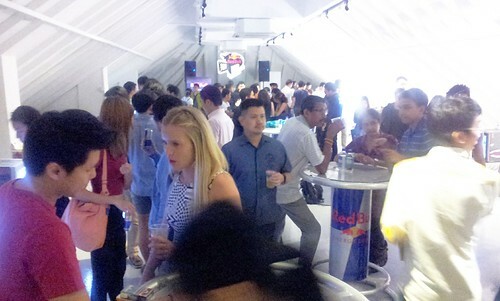 On 6th May 2013, in Singapore – The inaugural Red Bull Canvas Cooler Exhibition happened at Reading Room Singapore, followed by an energy-filled closing party. 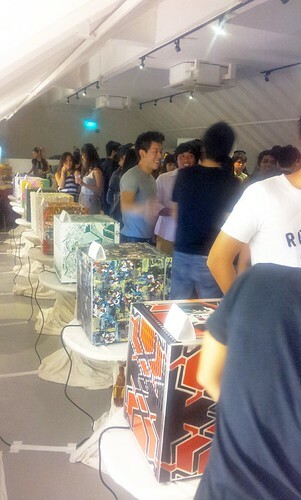 The European Red Bull gave wings to aspiring student artists during this event, where 28 Red Bull canvas coolers were transformed into functional and unique pieces of art over a month long creative process by 20 student artists and 8 established local artists and all pieces were curated for a one-of-a-kind art exhibition in Singapore for the first time globally. The Red Bull Canvas Cooler project aimed at creating an opportunity for aspiring student artists to interact and learn from industry opinion leaders. The project was supported by 8 renowned artists and designers in Singapore from various disciplines such as fine art, graphic design and illustration. They are Mark Ong (SBTG), Jeffrey Koh (Flabslab), Denise Jillian Tan, Little Ong (fFurious), Andy Yang, Samantha Lo (SKL0), Eugene Tan and Eric Foenander (creative head of Butter Factory). 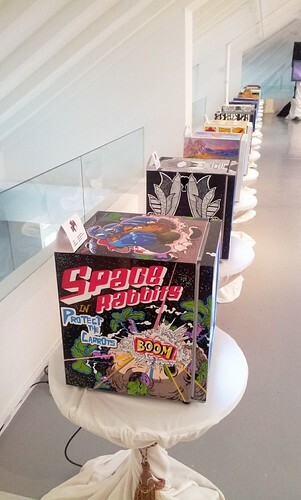 These established artists lent their artistic expertise and ideas to 20 aspiring art students who applied to create a functional art piece from a Red Bull cooler that is wrapped in canvas. Each of them acted as mentors to 2 to 3 students, providing guidance and feedback, during a month long creative process. They provided insights as to how the 8 Artist Mentors were gathered, and how the apprentices were filtered from the talent pool. It’s great that The European brand is not only a beverage company, but also as a Life-Style Brand that makes the effort to engage with local creative talents. Pouring in resources to create such a lovely platform for the youths to shine via their creative expression. Such activity, helps with the commitment of Artists that have been established in the industry, to mentor youth that are aiming to fuel the energetic creative industry. 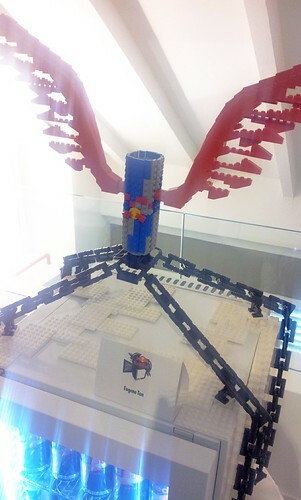 My personal favourite is Eugene Tan’s creation with LEGO bricks. From what I understood is that the “chains” were made of LEGO bricks set with resin; but one really wonders how the top part of the “Winged Red Bull Can” hold up. 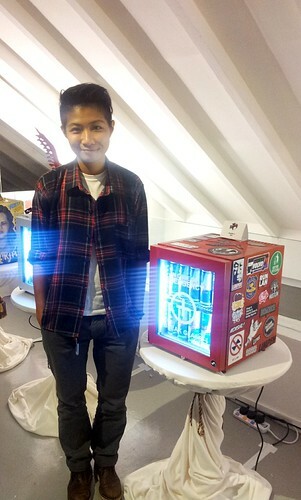 Samantha Lo (SKL0) spotted with her creation, all smiles and worry-free. So after the Closing party, what will happen to the 28 uniquely designed and functional Red Bull Canvas Coolers? When you paint the town red, keep a look out for these unique creations, in various bars and clubs around Singapore, including Home Club; Broadcast HQ; Attica and Em by the river, following the close of the exhibition. The Red Bull Canvas Cooler project has taken several stages in different parts of the world, giving wings to emerging artists as the concept catches on across the globe, most recently touring the US, Italy and Japan with unique formats in each city. For example, The Canvas Cooler project that was hosted in New York City, US in 2012 drew nearly 2,000 art enthusiasts who witnessed the live execution of 30 urban, contemporary as well as street artists expressing their creative flair in full flourish. 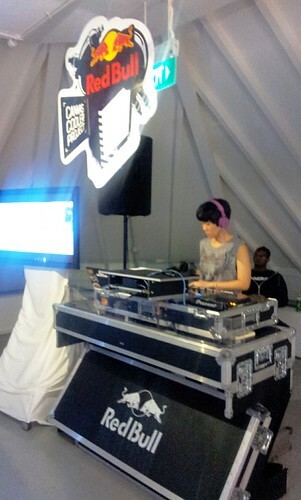 It is the first time Singapore has been a part of the Red Bull Canvas Cooler project.